One of the hardest things for me when I was struggling with Christianity was that age-old question: why did Jesus suffer and die… for me? I had thought of myself (and still like to think of myself!) as mostly a decent person. But, to lay down my life for someone else? That is something that I honestly would not willingly do, save for my closest family members, such as my children. But Jesus? He laid down his life voluntarily for our sake, though we have pretty much have done nothing to deserve it. And why? Because we are His friends and He loves us. Don’t believe me? Check out this bible verse. 7If you remain in me and my words remain in you, ask for whatever you want and it will be done for you. 8By this is my Father glorified, that you bear much fruit and become my disciples. 9As the Father loves me, so I also love you. Remain in my love. 10If you keep my commandments, you will remain in my love, just as I have kept my Father’s commandments and remain in his love.11“I have told you this so that my joy may be in you and your joy may be complete. 12This is my commandment: love one another as I love you. 13 No one has greater love than this, to lay down one’s life for one’s friends. 14You are my friends if you do what I command you. 15I no longer call you slaves, because a slave does not know what his master is doing. I have called you friends, because I have told you everything I have heard from my Father. 16It was not you who chose me, but I who chose you and appointed you to go and bear fruit that will remain, so that whatever you ask the Father in my name he may give you. 17This I command you: love one another. 1Therefore, since we have been justified by faith, we have peace with God through our Lord Jesus Christ, 2through whom we have gained access [by faith] to this grace in which we stand, and we boast in hope of the glory of God. 3Not only that, but we even boast of our afflictions, knowing that affliction produces endurance, 4and endurance, proven character, and proven character, hope, 5and hope does not disappoint, because the love of God has been poured out into our hearts through the holy Spirit that has been given to us. 6For Christ, while we were still helpless, yet died at the appointed time for the ungodly. 7Indeed, only with difficulty does one die for a just person, though perhaps for a good person one might even find courage to die. 8But God proves his love for us in that while we were still sinners Christ died for us. 9How much more then, since we are now justified by his blood, will we be saved through him from the wrath. 10Indeed, if, while we were enemies, we were reconciled to God through the death of his Son, how much more, once reconciled, will we be saved by his life. 11Not only that, but we also boast of God through our Lord Jesus Christ, through whom we have now received reconciliation. 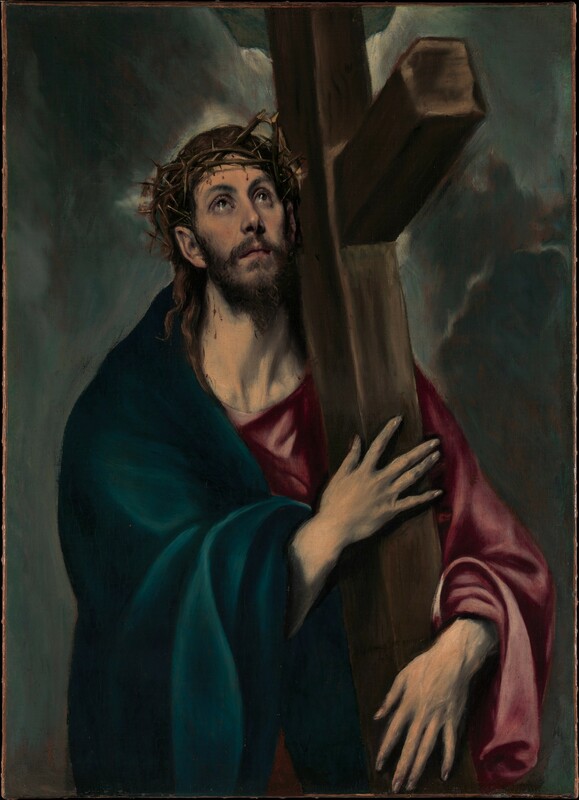 Christ Carrying the Cross, by El Greco, c. 1577–87. The Metropolitan Museum of Art, New York, New York, United States. There are many, many images of Christ carrying the cross with Him in agony and pain, mind you, which are probably more accurate, honestly, considering the brutal torture that He underwent before He even began to carry His cross. But this image is wonderful in itself for different reasons… and not just because El Greco, one of the greatest Spanish artists ever, made it! Just look at the little details. The cross seems larger than life, to the point where the clouds seem to part as the cross extends upwards. Christ’s eyes also look upward toward Heaven, with a gentle look on His face which suggests humble acceptance of His sacrifice. He knows what He is doing and why He is doing it. He is not being coerced into suffering, and instead freely accepts it. And why shouldn’t He? After all, He loves us more than we can ever know. He is God, after all! And even death itself could not stop Him from loving us. So, let us love one another and keep our hope in Christ! For their is no better thing for us to do in this world than to follow Christ. Thank You for Your sacrifice and for bringing us into Your love. Give us the strength to follow Your commands and to love other people as You loved us.